Sup all you playas?? Did that sound gangsta? I tried. Anywho, this gal has been super busy today. I attended our employee Bible study this morning, then snuck in a quick 3 miles to start the day off right. Next on the agenda was a quick trip to Knoxville to go BACK to The Limited since they had 40% off the already 70% off clearance. (SALES!!!) I found so so many great deals and practically got a new wardrobe! Go me! Are they me, or are they ME?!?! 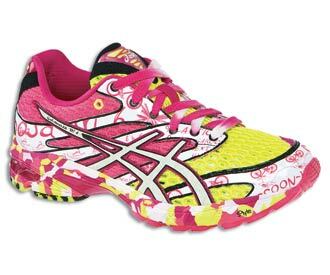 These are the Asics Gel Noosa Tri 6’s or whatever the politically correct term is. The sales lady told me they are meant to be worn barefoot and wet and perfect for Triathlons. We’ll see about that. I just like wearing them to make sure everyone knows I wear a size 10.5 and have an inner clown inside me. The best part? THEY GLOW IN THE DARK. Learned about your blog through Run On! Congrats on your weight loss. YOu look like a total badass in that picture of you kickboxing! just found your blog from Stef's post and am SO excited to follow you. ummm you are awesome and hilarious and I already just cannot wait to read your blog. those shoes = major jealousy right here. best shoes ever! Hi from a new follower and avid runner and blogger!I've seen the glowing shoes. Very cool! That reminds me I need new Saucony :)I'm hosting Fitness Friday blog hop beginning this week. I would love to have you join. Linking up is a great way to increase followers, readers and interest in your blog.Here are the detailsLife As I See It [FItness, Health and Happiness]Thanks! Ladies, I am totally feeling the love! Thanks so much for following me. As a relatively new blogger, it means so much to meet so many new people! I am now following all of y'all, so I really look forward to learning more about each of you! You ladies rock! !Megan, you are the super badA miss English teacher. Totally jealous of you! !Julia: the shoes are definitely a conversation starter and the fact that they glow in the dark are my favorite!Jill: You rock, girlfriend! Treat those feet to some Saucony!